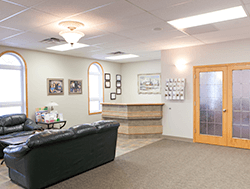 The large foyer and reception area is warm and inviting. 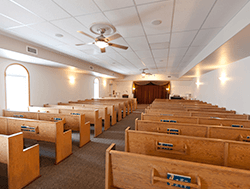 Our wide hallway and two wheelchair accessible washrooms make our funeral chapel accommodating to all the public. Our spacious chapel can accommodate up to 150 people. A closed circuit television and public address sound system, enables us to provide any music requested, or to videotape the service if required. We also have an organ and organist to help provide music ministry for any service. Adjacent to our chapel, the family room has many uses. It serves as an overflow area and can accommodate up to 50 people, with the service being viewed with live picture and sound from the main chapel. 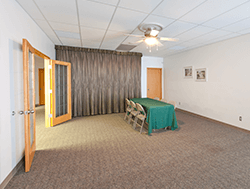 It can be used for a viewing room, a meeting area for family or pallbearers. With the addition of tables and chairs, we can provide an area for a lunch, coffee and fellowship following a funeral service, viewing or prayers. Our arrangement office is comfortable and private. 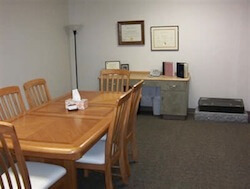 The large table allows all family to participate in the funeral arrangement process. We also have our indoor monument display in our office. There a cemetery monument design can be discussed. Cremation services are also provided through Weyburn Crematorium Ltd. in which we hold ownership. In our selection room we offer many choices in traditional and cremation caskets and urns. Solid and hardwood caskets, metal caskets in a variety of colors and gauges, as well as cloth cover caskets. The urn display contains many choices, including wood, metal, granite and biodegradable . We offer cremation jewelry, including finger print, glass cremation jewelry, sterling silver, stainless steel and keepsakes. Our intent is to offer merchandise that will meet the needs of every family we serve, and prices to fit any budget. 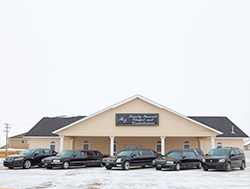 Our fleet of funeral cars includes a general purpose/Lead vehicle, funeral coach, two limousines that can be used for family or pallbearers (if requested) as well as a van. Extra vehicles are available upon request. Our large paved parking lot allows for ample parking of vehicles, as well as handicapped parking close to our covered entrance. If overflow parking is required, we have space at the rear of the building.